I have to throw this out to the readers. 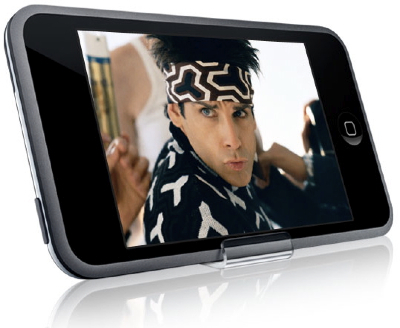 I have been contemplating purchasing an iPhone for a few weeks now. I so do NOT want to stand in line at an Apple store (I am impatient that way). I also do not want to be tied into a 2-year AT&T plan. My current provider is T-mobile. I like the service, and I am on a good plan. 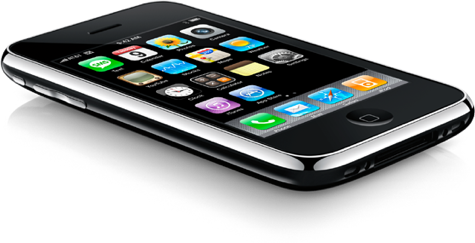 From what I understand, the iPhone can be unlocked to work on the T-mobile network. Has any of you had any experience with this? I believe I will have to go with a G2 Model as the new G3 can’t yet be unlocked to work with other networks. Man, these things are sweet…and expensive! On Craigslist & eBay an unlocked G2 is running around $300-$400. Still on the fence about the whole thing. I read that there are a lot of scammers and issues with unlocking the phone to work on other networks. 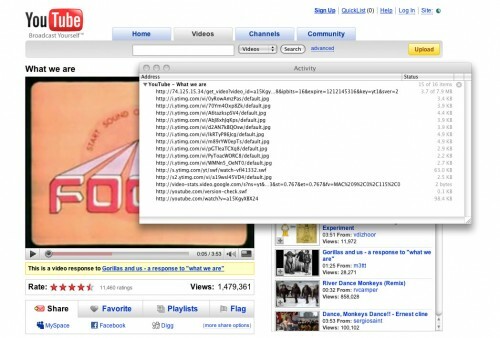 Safari comes with an incredibly powerful tool called the “Activity” window, which can be used to download YouTube (or any other video site) videos, files from websites, MP3s from Last.fm or any other type of file present that can’t be directly downloaded, right to your desktop. There are many third party applications and services that allow users to download YouTube videos directly, but many people do not realize that this functionality is built right into Safari. To illustrate this, I’m going to use YouTube videos as an example (.flv file format), but as stated previously this works with any online file. Simply go to the YouTube video page where the video plays, click Window -> Activity and a window will appear similar to the one pictured below. We’re shown a range of different files in this list, but we’re looking for the flv video file, which will most likely be the largest file of the list (highlighted below). Select that file, hit copy and paste it into the Downloads window (Window -> Downloads), and the video will start downloading to your desktop. Note: With YouTube videos, the downloaded file will be called “get_video” with no file extension, you’ll need to rename it to “something.flv”, in order to be able to play it. Apple’s minimalistic, aesthetic-focused product design philosophy seems to work very successfully in nearly every product they produce, bar one glaring exception; The Apple Mighty Mouse. For some reason, this product is, frankly, an ergonomic nightmare. Oddly, it seems to be shaped like some sort of alien pod from the future/space, not formed subtly to the natural flow of the human hand like you’d expect from a direct input device. This means that not only is it difficult to use (I sometimes find myself contorting my hand in wrist-tingling ways just to complete certain tasks as a part of my daily routine web-browsing and designing) but even more annoyingly, the pitifully tiny and strangely shaped scroll ball just stopped working for me a couple of weeks after purchase. At first it wouldn’t scroll down, then upwards motions stopped registering and finally it just completely stopped responding. Upon checking the Apple support forums I discovered a huge number of folks with similar issues, and none with a working solution (at least, for me). 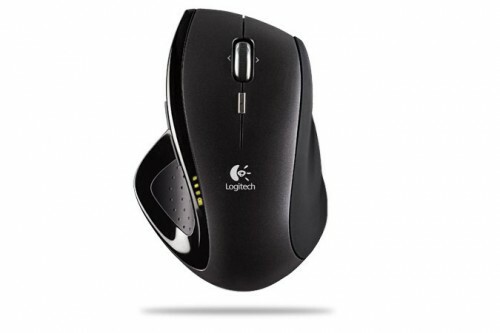 So, being completely fed up and ready to hurl this little smooth white hunk of useless shiny plastic through the wall, I ran out to a computer store and picked up the Logitech MX Revolution, having read such positive reviews for the thing by some respected bloggers (namely Glenn Wolsey). And wow, what a difference! I honestly can’t believe I’ve been using anything else over the past years. This mouse feels absolutely comfortable to hold, and has more features than ever imaginable. I’ve now set it up to have complete control over my iTunes, I can increase/decrease volume, skip forwards and backwards between tracks, play and pause the current track and even hit the “quick search” button to bring up CoverSutra‘s awesome input box to skip to specific tracks by typing in keywords. This is the best mouse I’ve ever held in my hand, and is in stark contrast with Apple’s rounded thing. If you’re considering a new mouse, then be sure to read more about the MX Revolution, and by god, think twice before grabbing the Mighty Mouse. Being a keyboard under my ownership is a stressful job. Due to my chosen profession, candidates need to endure not only the constant tapping of fingers, but the onslaught of occasional clumsy spillages. Be it from water, soft drink or more likely a large mug of coffee, it’s important that in such a stressful tim, my chosen keyboard has the stamina to emerge from liquid catastrophe. I’ve been through countless generic Microsoft keyboards, one expensive Logitech Multimedia number and more recently, one of the “old” Apple Keyboards. Yes, just as I thought I’d found the perfect keyboard, the hefty white Apple Wireless KB succumbed to a drowning from a half-full cappuccino. After trying for quite some time to resuscitate it, yanking out all the keys and cleaning like a mad thing, it remains sticky and mostly unresponsive. To the trash with it. But all is not lost, a little while ago I purchased the “new” Apple keyboard. Yes, the one that is about as thin as keyboards can get and about as beautiful too. Now, being used to plugging my fingers down on standard keyboards, I was worried that this new-fangled one would not have the necessary tact or the same feel as the keyboards I was used to. However after using it for a few months I’m absolutely in love with it, it feels great and has even survived an accident involving water, a pizza and a mug of coffee, and it’s still going strong. And that’s all I ask for in a keyboard. 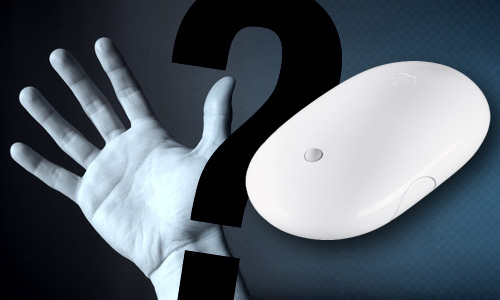 Kudos, Apple… Now just fix the darn scrollball in this wireless Mighty Mouse. I paid a visit to the Australian Apple Store today, intent on buying a 160GB iPod Classic. Luckily I was halted, an given this conspicuous server error, else I would have rushed in and spent my money simply out of spite of the iPod Touch’s lacking in sufficient storage. 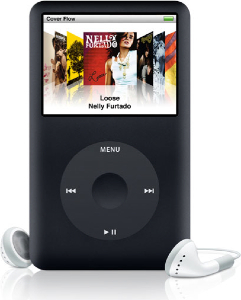 So, as you probably are very well aware, Apple has recently updated its ever-popular iPod product line with brand new iterations of the “regular” iPod (now labeled iPod Classic) and Nano, as well as introducing the iPod Touch. In the lead up to this announcement, I was excited to stipulate that Apple would be releasing a wide-screen, multi-touch version of their iPod, and I was correct in this assumption. However, I’m disappointed to learn that the Touch only sports up to 16GB of storage capacity. 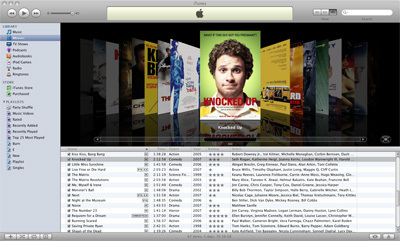 Apple; I wanted an iPod with a big, beautiful screen to watch my movies in gorgeous detail, and you’ve done very well to provide this. But, I need enough damn space to store my relatively modest collection of videos and TV shows. 16GB is not enough space for a device that is well suited for videos. Ditch the slimmer, solid-state memory and throw in one of those 160GB disk drives that you seem to be using in the Classic. Then, and only then, I’ll relinquish my $400. One thing that has changed about me over the year and a half since I switched to the Macintosh platform is that I’ve found a willingness to pay for Applications. All but abolishing my previous habit of pirating Windows software (admit it, we’d all rather fire up BitTorrent than hand over cash to Windows App Devs). This is a change that I had never expected, although it can surely be attributed to a few different factors. When it comes to advertising an OS X application, the general mindset is as follows: Show them what our product does. If they like it, they’ll want it. 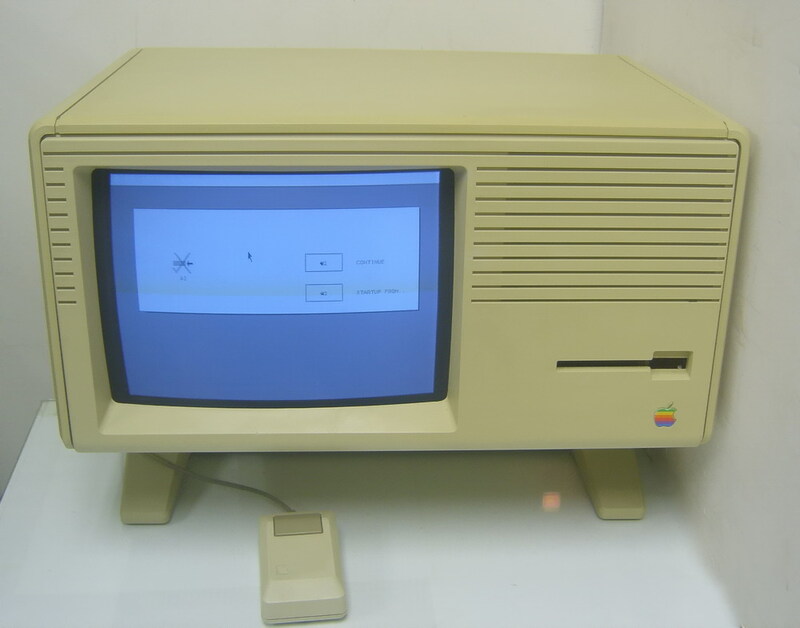 Macintosh applications do exactly as they say on the box (or the website, as it were). Over at the Windows camp, many companies see advertising as: Make our product look as good as possible, even if it’s not. Which is a total drain on user confidence. In order for me to be ready to fork over my hard-earned cash to a software developer, I have to truly feel confident about doing so. I actually want to support the creators of Mac applications, because they seem so genuine. In most cases, Mac Software is developed not by monolithic, research-toting, money hungry corporations, but rather a lone developer or tight-knit group of people who are passionate about their craft. I feel as if my spending is a contribution to the livelyhood of these people, instead of “just another sale” for the faceless corporation. Mac people are great people. Period. You can always count on an enthusiastic and open zealot to handle your support questions personally, and a wonderful community of like-thinkers. The Mac culture (you could nearly go as far as calling it a Philosophy) is one of warmth, confidence, welcoming and support. You simply can’t buy that kind of thing. 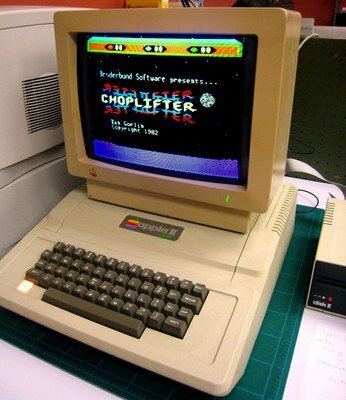 Sure, there are a number of great Windows Applications that transcend the image of their colleagues, but certainly not to the extent of frequency in the Macintosh world. 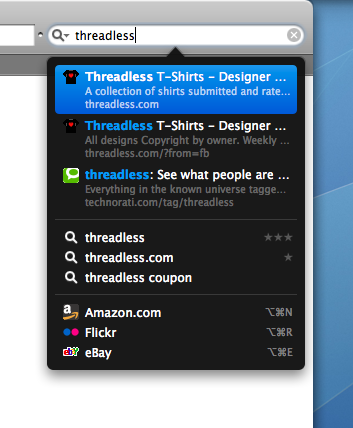 Inquisitor is a great little addon to Safari that adds an in-depth popup to the search box. It’s easily and quickly accessible with keyboard shortcuts, and now that I’ve finally tried it out, it’s proving to be much more than the gimmick I originally thought it to be.